Just as you don’t like looking up into your neighbors’ second-story windows, they would probably prefer not to stare straight down at your fire pit from their bedroom. When considering how to carve out more privacy in your yard, look for ways you can use plants, pergolas, awnings and free-standing walls to screen views and muffle noise for mutual benefit. Here are 12 ideas to get you started. 1. Translucent panels. If you’re looking to block an adjacent building but still would like light to pass through a screen, frosted glass can be a highly effective material. In this San Francisco Bay Area home, sand-blasted glass panels create a luminous privacy screen for an outdoor dining area. 2. Free-standing walls. 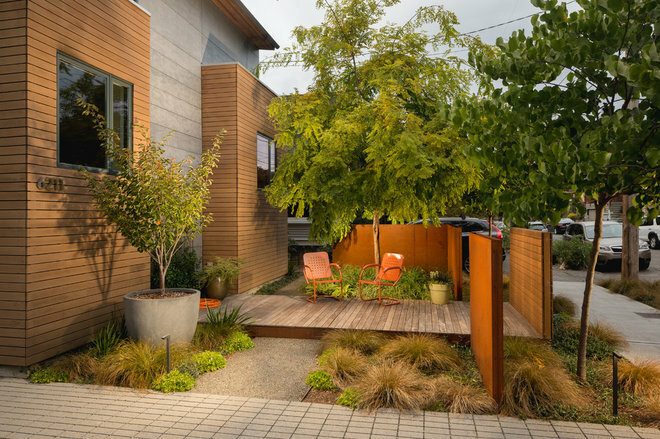 Staggered Cor-Ten steel and wood panels create a feeling of privacy in this Seattle front yard without completely closing the garden off from the street. Play with the heights of free-standing walls — notice how the ones here are sized to block a parked car from view — to adjust to the specifics of your site and what you’d like to screen. 3. Hedges. 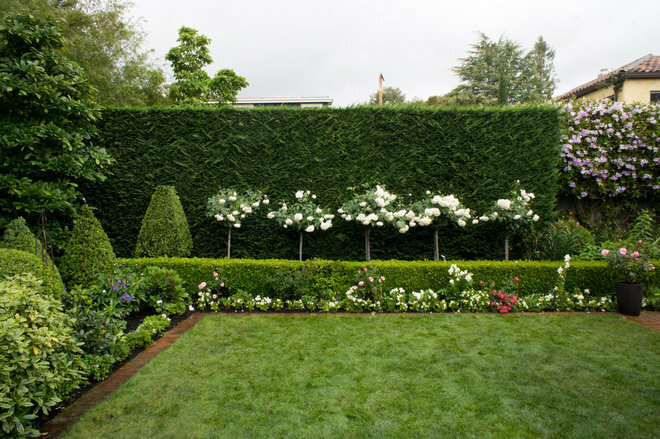 When choosing a plant for a hedge, consider whether you’d like total privacy in the form of a solid hedge or less privacy with one that is lighter and airier. For maximum privacy and sound suppression, select evergreens with a dense growth habit, such as arborvitae (Thuja occidentalis, USDA zones 3 to 7; find your zone), ‘Spartan’ Chinese juniper (Juniperus chinensis ‘Spartan’, zones 4 to 9) or cherry laurel (Prunus laurocerasus, zones 6 to 8), and space them half of the recommended planting distance apart. For lighter screens that allow light to pass through, choose evergreens such as fern pine (Podocarpus gracilior, zones 8 to 10) or ‘Silver Sheen’ kōhūhū (Pittosporum tenuifolium‘Silver Sheen’, zones 8 to 11). 4. Pleached trees. For this hedges-on-stilts look, train young trees with pliable branches into nearly planar screens by bending and interweaving their branches. 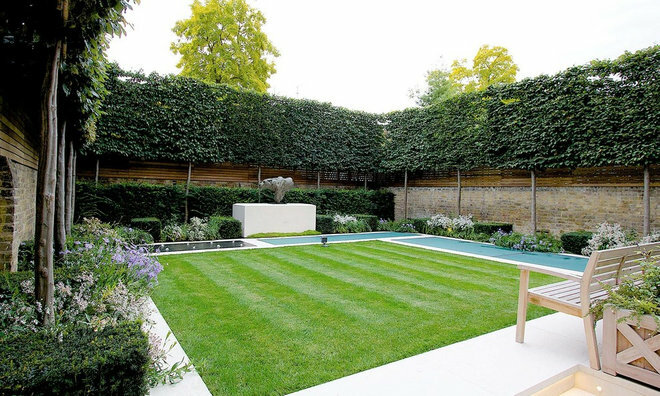 In this London backyard, pleached Carpinus trees kept to about 10 feet tall screen adjacent homes but take advantage of attractive views of neighboring tree canopies. 5. Windowed views. 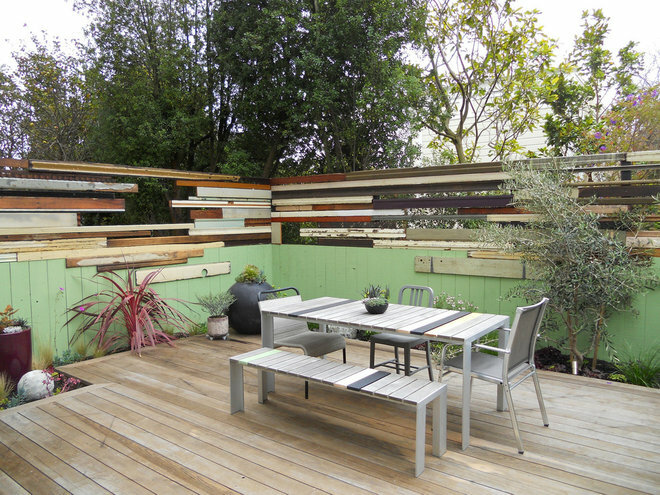 A fence made of multicolored recycled wood surrounds the deck behind a San Francisco home, creating a private nook for an outdoor dining area. Irregularly shaped windows among the boards offer selective views of the trees beyond. 6. Slatted screening. Create a feeling of enclosure and interrupt views from neighboring homes with a more modern take on a traditional pergola. 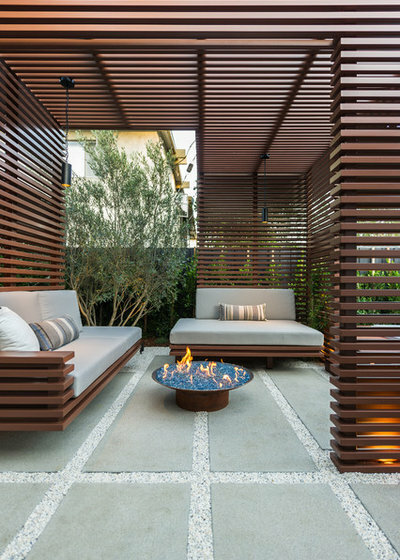 The designers of this Los Angeles backyard used painted steel tubing mounted on posts to create a slatted privacy covering for a backyard lounge. 7. Laser-cut metal. 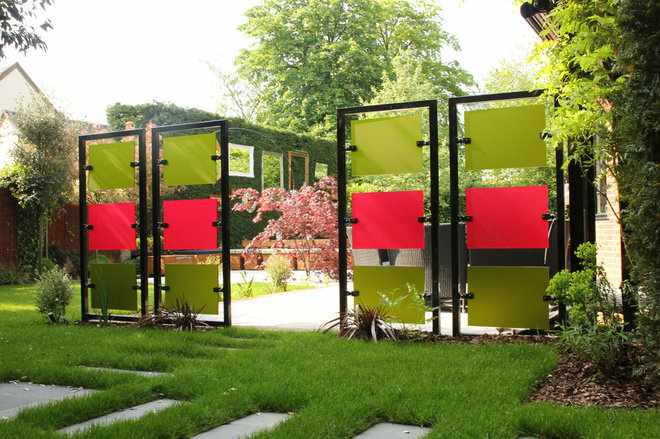 Becoming more common in garden design, artistic screens made of laser-cut metal can be used to separate garden rooms, screen a hot tub or hide landscape bins. Mount them a few inches in front of a wall and add lights in the evening to appreciate the shadows cast by the metalwork. 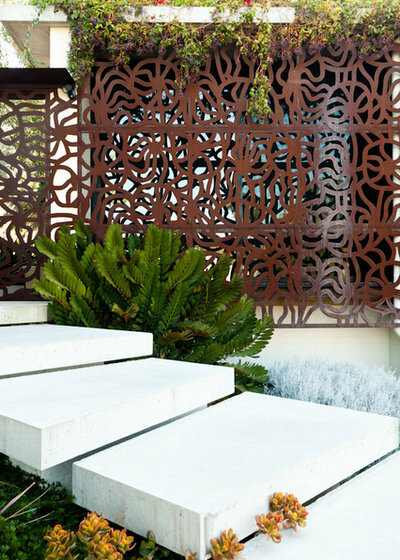 For this home in Perth, Australia, a laser-cut screen with a swirling, almost nautilus-like design provides privacy at the front entrance. 8. Wood lattice. Inexpensive and widely available, crisscrossing wood lattice is a great screen material for partial privacy. 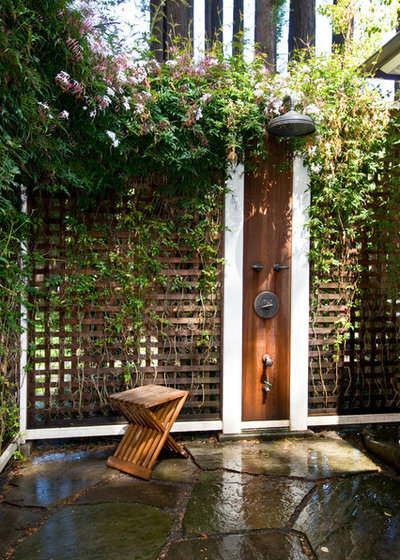 To more fully conceal an outdoor shower, the designers of this Woodside, California, backyard planted fragrant pink jasmine (Jasminum polyanthum, zones 8 to 10) to fill in the gaps in the lattice. The spaces between the wood slats allow air to move freely and light to filter through to help dry the area after a rinse. 9. Paneled fencing. 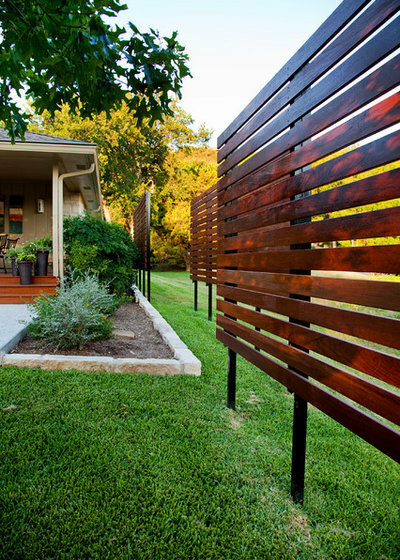 To create more privacy for this home in Austin, Texas, the designers mounted a series of free-standing wooden screens, staggered to allow passage between them. The advantage of using freestanding panels, rather than a traditional fence, is that you can adjust the height and placement of each section to selectively screen unattractive views or adjacent buildings. 10. Colorful acrylic. 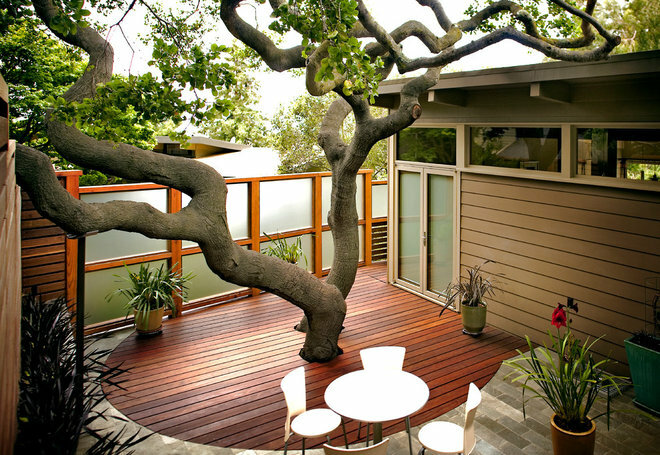 If you need a screen for privacy or to separate one garden area from another, why not have it be an outstanding feature? Here, semitranslucent colorful sheets of Perspex acrylic mounted in stainless steel frames make a statement. 11. Layered materials. Dense materials such as metal, stone, brick and concrete are by far the most effective at absorbing sound waves from traffic or industrial machines. Layer with lighter materials, such as hedges and wood fences, to block more sound than if the materials were used individually. Adding a more peaceful sound such as the splash of water can also help. 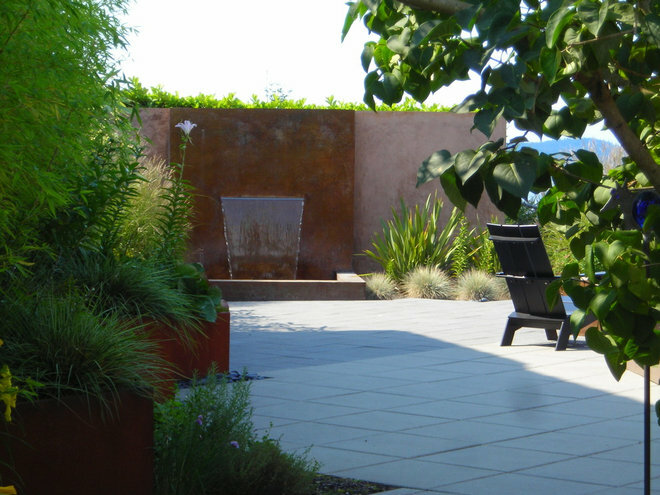 The designer of this Seattle courtyard did both: A free-standing metal wall with a built-in fountain adds privacy from neighbors and cuts the noise from a nearby street, while the falling water introduces a soothing sound. 12. Potted plants. Good-sized container plantings can be effective at screening views for rooftop and balcony gardens. 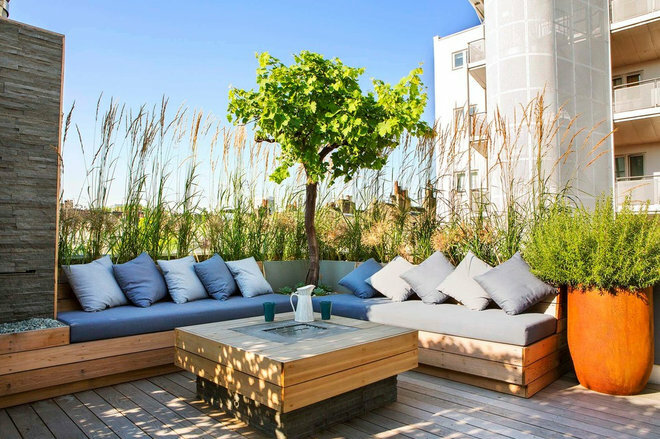 Ornamental grasses provide light screening from adjacent apartments on this balcony garden in London’s Notting Hill neighborhood, and would sway beautifully with the slightest breeze.